In the wake of a visit to parts of Puerto Rico ravaged by Hurricane Maria, Florida Governor Rick Scott has declared a state of emergency Monday for all Florida counties in an effort to help those forced to leave the island nation following the devastation. Scott also announced the opening of several Disaster Relief Centers to help those displaced by the storm, including two in South Florida at Port Miami and Miami International Airport. Gov. 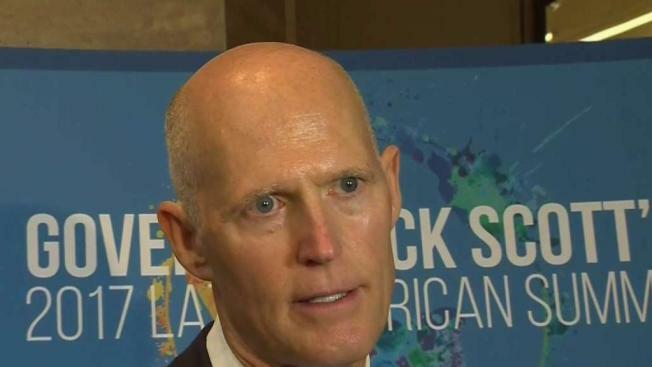 Scott has been vocal in recent days regarding efforts to help those affected by the storm rebuild if they move to Florida – including offering in-state tuition to students that look to continue their education in Florida. Scott recently met with President Trump, who has come under fire from some over his administration’s response in the nation, and urged him to push forward efforts to get resources to the island, including fuel and military aid to help in the rebuilding process.